H.P. Lovecraft, known to the aficionados of the occult--demonology, witchcraft--as a master storyteller, is responsible for our first selection in this museum of the frequently morbid. To you connoisseurs of the black arts, you’ll probably recognize it. It’s a painting that tells the story of a young artist who recruits his models from odd places. And the models are very odd indeed. The painter’s name, incidentally, is Pickman. The title is “Pickman’s Model.” And where else would you see a story like this except in the Night Gallery? In the early 1970s, everyone knew Rod Serling, the charismatic and affable host of the science fiction show The Twilight Zone. Nearing age fifty, Serling had presided over much of the golden age of television, from his work on the pioneering Playhouse 90 to his current gig, hosting an anthology show of horror stories, The Night Gallery. On his programs, Serling often presented a strange and remarkable world where the inexplicable was commonplace, and the impossible happened each week. More often than not, the cause of these strange occurrences came from the depths of outer space. “Rod Serling freely admitted that he was unabashedly a great devotee of tales of horror, fantasy, and the supernatural,” his wife Carol remembered [n.2]. Serling had grown up at the height of the pulp fiction era, reading classic and modern horror stories in sensational magazines like Weird Tales and Astounding Stories. His favorite authors were Edgar Allan Poe, whose terrifying nineteenth century tales spoke of macabre minds, and H.P. Lovecraft, whose Depression-era stories of cosmic horror hinted that buried in man’s past was archaeological evidence that humanity had once been visited by extraterrestrials. By the time Serling entered television, Lovecraft had become something of a cult figure, inspiring a devoted following of fans. Lovecraft’s influence clearly showed in Serling’s work. In The Night Gallery anthology series, several of the episodes were based on Lovecraft’s stories, including “Pickman’s Model,” where the monster in a painting is not just a figment of the artist’s imagination. In The Twilight Zone, occasional hints of cosmic horror surfaced amidst the out-and-out science fiction. Most impressively, in Serling’s best-loved film, Planet of the Apes, which he wrote, archaeological anomalies revealed a dark secret about an alien world. No one can forget the startling vision of the ruined Statue of Liberty in the film’s famous closing scene, or even the hints of earth life in the apes’ archaeological investigations. Serling had in effect reversed the Lovecraft premise: instead of humans finding evidence of aliens, it was the strange beings (the apes) finding evidence of us. So the concepts of archaeology revealing startling secrets was nothing new to Serling when in 1972 his producer, Alan Landsburg, called him on the phone to tell him of an amazing discovery he made. “Rod,” Landsburg told him, “I think it’s real. I think I can prove that Earth was visited by intelligent life from outer space” [n.3]. Serling was not terribly amused at first, but Landsburg presented seemingly miraculous evidence that man had in fact been visited. He claimed to have seen the runways where their crafts had landed and cryptic signals built by the visitors. Further, he had seen the actual remains of structures they had made while they were here. What made Landsburg’s revelations particularly shocking was the remarkable claim that the aliens had not come today or yesterday but had come thousands of years ago. Called either the “ancient astronaut hypothesis” or Paleo-SETI after the Search for Extraterrestrial Intelligence conducted by NASA, the theory held that in the remote past aliens had come to earth and ancient humans mistook them for gods. These visitors wowed the natives with their technological prowess, and they left traces of their coming in ancient myths and monuments. Sitting across the table from Serling, Landsburg pulled out series of photographs of things that should not be. He showed him snapshots of millennia-old batteries, ancient drawings of spaceships, radios, and airports--all dating back to the darkest and most remote corner of humanity’s ancient past. These were things that should not be, but they were here; they existed. Truly, if these things were real, then humanity’s earliest gods were extraterrestrials whose amazing technology had given them the aura of the supernatural. This would be the story of the century, and Rod Serling was there. “Had it been anyone else,” Serling later wrote, “showing the objects and pictures to me, I might have said ‘Mountebank!’” [n.4]. But Serling trusted that the talented television producer was on to something: “He had more than the amateur’s command of the fields of archaeology, biology and related scientific investigation. By the time we were finished I had seen enough evidence to convince me that we had entered a new and fascinating field of research” [n.5]. Yet it seems impossible that Serling could not be at least a little troubled by the odd similarity that this amazing new research showed to those stories of Lovecraft he had read in his youth. Might there be some connection between the horror author’s tales of alien gods and this seemingly miraculous proof? Serling held his doubts but decided that the connection just wasn’t there or never put the pieces together. Much of Alan Landsburg’s interest in the subject had come from a fiery and outrageous best-seller called Chariots of the Gods?, written originally in German in 1968 by a Swiss hotelier named Erich von Däniken. In that book, von Däniken had shockingly claimed that alien beings from another world had descended to earth in the remote past, genetically engineered humanity, built the greatest monuments of the past, and then left with a promise to return. Von Däniken blasted conventional archaeology for ignoring what was clearly evidence of humanity’s alien heritage, and his words struck a cord with Landsburg and with many people living through the heady days of cultural upheaval and the wholesale rejection of convention in the late 1960s. In 1972, Landsburg made his call to Serling to share von Däniken’s shocking claims. After Serling had become convinced that the theory held water, he and Landsburg plotted their next move. This information was too sensational, too amazing to be kept to themselves. If archaeology were ignoring, or worse attacking, these theories, then they would bring them directly to the people. The two men worked together to bring Chariots to the small screen in the form of a television documentary. Entitled In Search of Ancient Astronauts, the NBC special outlined the major points in von Däniken’s thesis, taking the viewer around the world to survey the incredible evidence for alien intervention: the impossibly large pyramids around the world, the haunting statues of Easter Island, the alien runways at Nazca in South America. Rod Serling’s credibility and celebrity helped to give weight to this seemingly impossible idea. The documentary was a huge success and catapulted the ancient astronaut hypothesis from the fringes of the intellectual fringe right into Middle America. “It brought together on film,” Landsburg wrote, “some of the visible signs that Earth might have been visited long ago by astronauts from some other world—visitors whom the awed Earthmen would probably have taken for gods” [n.6]. With Serling’s distinctive voice intoning questions about how mere mortals could construct the colossal bulk of Egypt’s Great Pyramid or how the Nasca [n.7] could have laid out an airport in the deserts of Chile, millions of Americans were exposed for the first time to the idea that the wonders of the past were monuments to extraterrestrials. And many of those viewers became convinced that something was amiss with the textbook view of the ancient past. In the year after In Search of Ancient Astronauts aired, von Däniken’s little book became an overnight sensation in the United States. While it had run as a six-part serial in the National Enquirer three years earlier, it now sped through thirty-seven printings. By the beginning of 1974, four million copies were in print, and the sequels Gods from Outer Space and Gold of the Gods were selling rapidly. Other authors quickly jumped on the bandwagon, including Alan Landsburg, who along with his wife released In Search of Ancient Mysteries and its follow-up, The Outer Space Connection, providing a still larger compendium of ancient mysteries. Ancient astronauts had become a literary genre, and its authors now claimed that the aliens had initiated a cult of immortality and that aliens may even have had a hand in manipulating human evolution or genetically engineering humanity. While the idea that aliens were our ancestors quickly came under attack from scientists as impossible and false, it continued to garner impressive numbers of followers. Von Däniken would go on to write over twenty-five books expounding his claims, and his imitators and followers each wrote several more. Mainstream science began to take note, and archaeologists had to insert comments refuting alien intervention in their books, articles, and documentaries, if only to show that they thought nothing of the idea. I came to the theory of ancient astronauts a bit late. Not born until after the initial craze had faded away, I never experienced the first wave of alien ancestor frenzy. For me, my first contact with the world of the strange came from television. In countless hours spent watching the Discovery Channel and A&E, I had encountered this strange idea of prehistoric visitation buried in the sensational documentaries that I could not have then known were less than faithful to facts. In reruns of Leonard Nimoy’s classic series In Search Of… and in episodes of his then-current show Ancient Mysteries, I saw what the shows said were experts telling me that aliens had come to earth, had created its ancient wonders, and were still coming today. When I was young and in full intellectual rebellion against my schooling, I found this idea seductive, and I believed whole-heartedly in the theory of ancient visitors, convinced that the powers that be were concealing a fabulous past from me. I wanted to believe and I needed to believe. Always a bright child, I had advanced beyond my studies quite quickly, and this theory seemed to provide the intellectual stimulation that my endless thirst for knowledge needed. Yet even as I adopted wholesale these amazing ideas, I did not possess the intellectual tools needed to critically evaluate them. Still seduced by the idea that something was right because an authority figure told me so, how could I doubt what the glowing box told me each Saturday afternoon, or what the cumulative weight of the ancient histories seemed to say? Yet in the back of my mind, there still existed the seeds of doubt. If the television shows kept insisting that the “orthodox” archaeologists were wrong, how could I be sure that the television was right? In other words, if the proponents of the Paleo-SETI hypothesis claimed that authority figures were wrong, and they were right, how could I then accept their authority? I had quiet doubts that something was wrong. Nevertheless, I bravely soldiered on. Being a voracious reader and as rather indiscriminate in my choice of books as I was in documentaries, I had absorbed all the classics of the ancient alien genre. My father had been taken by von Däniken’s musings during the theory’s early heyday, and he had a worn and tattered copy of Gold of the Gods, which I read and loved. Unable to satisfy my lust for ancient mysteries with just one book, Gold inspired me to seek out more “forbidden” knowledge.I devoured all the books of the preceding decades, including von Däniken’s collected works and several strange tomes on pyramidology. I was intrigued by the subject. The pyramids were an endlessly fascinating topic, and history had always been something I loved. It seemed for all the world that von Däniken was right, that he must be right, for his theories seemed to make so much sense at an emotional level. Besides, how could the book companies and television documentary people ever let these theories get through if they were not true? After all, was there not corroborating evidence in the many UFO sightings and abductions seeming to plague the less intelligent parts of the population? What backwoods area was not rife with tales of strange crafts and intimate probing? I was particularly susceptible to this line of reasoning, though not from living in the backwoods. One hot summer day in my early teens, my brother came running up along the side of the house. He called for the whole family to come outside, shouting, “Look up there!” When I looked up, I saw a round, shiny disc hovering in the sky. It stayed up there for a few minutes before vanishing. Despite my best efforts to locate an explanation, it remains unexplained. If I had seen a UFO, then clearly something had to be going on. In the year that followed, I read everything I could on extraterrestrials, UFOs, alien abductions and such. I read about the terrifying abduction of Betty and Barney Hill, a couple who claimed under hypnosis to have been taken by space aliens and to have had bizarre procedures performed on them. Theirs was the first widely reported case of forcible alien abduction and set the template for all that followed. I studied the so-called Roswell Incident, where a flying saucer was supposed to have crashed in 1947 in the New Mexico desert, and I read the original FBI cables about so-called flying discs recovered there and secreted to Ohio (yes, Ohio) and then the forbidden Area 51 where they became the basis for the Stealth Fighter jets. But I quickly realized that this was nothing more than a modern myth. The original FBI cable had said the disc was small and at the end of a balloon (something so-called ufologists ignore when trumpeting the case). I thought, why would space aliens need a balloon? If they could cross galaxies, why not New Mexico? Then I found out that the celebrated abduction of Betty and Barney Hill that launched the modern alien abduction hysteria could all but conclusively be shown to descend from the movie Invaders from Mars and an episode of The Outer Limits that aired only days before the “abduction.” Key to the case: the Hill abduction featured the now-stereotypical bug-eyed aliens unknown in 1960s Hollywood. Yet that Outer Limits episode featured aliens fitting the exact description of the Hills. In other words, the Hills’ description of the aliens was ripped right from the television shows they had just finished watching. After I found out how many UFO photographs were faked (and badly! ), suddenly, UFOs seemed a lot less interesting to me. As I learned more about physics and the complications of space travel, alien arrivals seemed less likely. Soon enough I came to the conclusion that aliens probably were not visiting earth since it would take millennia to transverse the infinities between star systems. So what about the evidence for ancient aliens? In 1996, I found what seemed to be a logical answer on an episode of A&E’s Ancient Mysteries where Star Trek’s Leonard Nimoy introduced me to Graham Hancock, whose book Fingerprints of the Gods (1995) allowed all the anomalous evidence for ancient aliens to stand intact without the need for extraterrestrial visitation. Hancock proposed that a great lost civilization had existed before the end of the last Ice Age and that its global traces were what led to similarities in the great works of ancient cultures. The lost civilization’s ambassadors were remembered as gods, and the ancient anomalies were their fingerprints. All the stories about higher beings that von Däniken had interpreted as evidence of aliens now became tales of the representatives of an advanced lost civilization. What could make more intuitive sense? In the last months before the internet revolution transformed bookselling on a mass scale, the local bookstore was the only place to seek out titles of interest. Late in 1996 I went to Barnes & Noble looking for a copy of Fingerprints, but there was none to be had. The clerk told me that the book was so immensely popular that the store could not keep it in stock. I had the store order me one, and six weeks later I plunged into a rip-roaring adventure in the style of Indiana Jones. Hancock’s book was magical, and for me the only training in mythology and ancient history I had received thanks to a failing public school system more intent on indoctrinating political correctness than teaching much of anything. And with a monstrous set of endnotes and book-length bibliography, how could I doubt the veracity of the formidable volume? In short order I read Hancock’s sequel Message of the Sphinx (1996) and his original exploration of an ancient mystery, The Sign and the Seal (1992), which probed the origins of the story of the Ark of the Covenant and where the relic, if it exists, might rest today. To this day, I find The Sign and the Seal a fascinating and imposing work of journalism, if not history. Intrigued by the material presented uncritically before me, I devoured every book on the subject that I could find. I read classics in the genre like Gerald Hawkins’s Beyond Stonehenge (1973) and more recent works like Robert Bauval’s Orion Mystery (1994), which claimed that the pyramids at Giza were laid out to represent on the ground the belt stars of the constellation Orion. Then I explored Robert Temple’s unique vision of the world by reading his The Sirius Mystery (1998 revised edition). The almost scholarly ethnographic analysis of the descent of Africa’s Dogon tribe from Ancient Egyptian stock made perfect sense to an uncritical layman, even if his claim that they ultimately originated in amphibious aliens from Sirius did not. I can only put it down as the folly of youth that I had not thrown away the book just on the basis that amphibians from Sirius were treated as a serious revelation. The Sirius Mystery had argued that ancient Egyptian science was highly advanced and a legacy from a higher culture not of this world. Their special knowledge that Sirius was two stars instead of one (a binary system) had passed to the Dogon tribe through a long, documented line of descent. French anthropologists Marcel Griaule and Germaine Dieterlen had discovered this latent tradition intact during their research in 1935. The Dogon should not have known this cosmic fact because Western science had only discovered it in the preceding decades. Yet still, no matter how successful the theory of prehistoric aliens or a lost civilization had become, something just didn’t feel right to me about the idea, even as I embraced it as the best-case scenario in my youthful wish fulfillment. This had nothing to do with the evidence, which I was then not qualified to evaluate, knowing almost nothing about archaeology other than what the ancient astronaut books had told me. No, my doubts were something different, even if surveys found that anywhere from a third to half of my college-age peers believed [n.9]. Underlying the grand edifice of the ancient astronaut theory was a small seed of doubt that would pop up time and again: wasn’t there something vaguely fictional about the story? Didn’t it sound just a little bit like something out of science fiction? Or, more to the point, hadn’t I heard this all somewhere before? My other favorite genre for reading material was horror. While I was never a big fan of Stephen King, nor had I the patience to read his long novels, I instead developed a taste for short horror fiction, inspired in part by other musty paperbacks from the early seventies: the Fontana books of horror, Alfred Hitchcock’s collections of gruesome tales, and above all cheap reprints of Edgar Allan Poe. I progressed to other anthologies, and there I discovered the works of H.P. Lovecraft, whom Steven King called “the 20th century’s dark and baroque prince” [n.10]. In Lovecraft’s sixty-odd tales of “cosmic horror”, I encountered an incredible landscape of terror, the likes of which I had never imagined. Lovecraft wrote in intricate detail about cosmic vistas and soul-shattering philosophies that were beyond comprehension. Truly he deserved his place as the greatest author of horror in the twentieth century, the worthy and acknowledged successor of Edgar Allan Poe. He dreamed up monsters so amazing that they blew away the tiny terrors of Poe or the bloody inanities of Clive Barker. No, this was something special, something amazing, something...familiar. Old Castro remembered bits of hideous legend that paled the speculations of theosophists and made man and the world seem recent and transient indeed. There had been aeons when other Things ruled on the earth, and They had had great cities. Remains of Them, he said the deathless Chinamen had told him, were still be found as Cyclopean stones on islands in the Pacific. They all died vast epochs of time before men came, but there were arts which could revive Them when the stars had come round again to the right positions in the cycle of eternity. They had, indeed, come themselves from the stars, and brought Their images with Them [n.11]. Here was von Däniken’s case outlined forty years earlier! How could this be? Initially I ascribed it to coincidence, for surely the ancient astronaut theory must be true, and therefore this story could not be related. Yet as the years went by, I could not live with the strange and unsettling thoughts that questioned this belief. Eventually I would come to realize that H.P. Lovecraft was the seminal figure in the world of alternative archaeology, and it was from his imagination that nearly all of the strange theories and alternative explanations were channeled. Lovecraft towered above all the other figures of fact and fiction as the first cause of the ancient astronaut hypothesis, and it was from him that all subsequent tales of extraterrestrial gods and lost civilizations came. But this ultimate revelation, this understanding of Lovecraft’s place was a long time in coming. Piece by piece, the puzzle started to fall into place. By the time I had entered college, I decided to seek a degree in anthropology because these books on ancient mysteries and the stories of Lovecraft had so inspired me. Along the way I began to develop a broad understanding of the historical process and the evolution of society over the course of centuries. At last I came to the conclusion that Western Civilization was in terminal decay. Inspired by Jacques Barzun’s peerless From Dawn to Decadence, I began to see that the civilization born with Charlemagne had run its course, that the Revolutions of the eighteenth century had marked the beginning of the end, and that the decline and rot had set in shortly after. Still awesome in its sweeping grandeur, the old world order continued on, pained by revolution, revolt, and change until the epic disasters of the two World Wars destroyed forever the old ways. I saw now that the period of the Cold War and what followed was the twilight world akin to the strange days between Rome’s fourth century collapse and the early medieval genesis of a new civilization. Were sixth century Gauls Romans or French? Are we still the West or something new? I saw then that a great change had begun, but the new order had not yet arrived, so in this twilight of the West with the old cultural authorities overthrown and broken, it was no wonder that so many had come to reject science, which was nothing if not the defining characteristic of the West. I began to understand what had gone wrong, and soon I had even more evidence confirming my hypothesis. In 1979, at London-Heathrow airport I bought a book called The Sirius Mystery by Robert Temple [which] explored aspects of Ancient Egyptian astronomy, and as I was both an amateur Egyptologist and a keen student of Ancient Egyptian astronomy, it seemed like a good book to take to the Sudan... Temple had uncovered a mystery worthy of further investigation. If the Dogon had inherited their knowledge of Sirius B from the Ancient Egyptians, what other knowledge might these ancients have had concerning the stars?... It seemed obvious to me that the place to look for evidence of this lost knowledge was not among the tribes of Mali but in Egypt itself [n.13]. Temple had a further influence on the developing theory that the Egyptians modeled the Giza pyramids on Orion because Bauval followed Temple in claiming that the pyramids represented the stars important to the Ancient Egyptians: “After all, the pyramids were built at the time Robert Temple believed the star religion to have been of the greatest importance. Perhaps then the two were linked” [n.14]. Temple had postulated that cities in ancient Egypt and Greece were planned to resemble the constellation Argo. Bauval applied the star-mirroring idea to the pyramids and “discovered” that the three Giza pyramids represented the belt stars of the constellation Orion. Shocked and appalled by this revelation, I logged on to Graham Hancock’s website, where Robert Bauval often answered questions. I asked him about his connection to Temple and whether he believed what the author had written. Bauval told me in an online discussion, “[While] I also know Robert Temple personally, it also does not mean that I support his ideas.” [n.15]. Yet I had the explicit evidence in his own words that he did in fact support Temple’s thesis, and not only that, he used it to support his revolutionary Orion Correlation Theory. Since I knew that Temple was demonstrably wrong, I had no choice but to conclude that the pyramids might well represent Orion, but the theoretical basis for the theory relied so heavily on Temple’s work that it must be discarded. Along with that, the work of Hancock and his predecessors fell, too, since all of the books on ancient mysteries referred to one another as their sources and their research. With that, I had to sadly conclude that I had been deceived. Even though I loved these books, I knew they were not true. Sure, there were anomalies worthy of investigation and even a possibility that somewhere in the distant past there was some sort of link between cultures or even a vanished civilization, but this evidence that these authors presented was not the answer. I had hoped that it was true; I had wanted it to be true. But I could not prove it, and neither could they. But what I could prove was where these ideas had come from and how they ended up in my head. Surely it was no coincidence that H.P. Lovecraft had written stories of alien gods decades before other authors made his science fiction into their science fact. Surely Rod Serling was on to something when he mused that the ancient astronaut theory (and by extension, the lost civilization theory) read more like the work of a fiction writer than a scientist. It didn’t take much to find the hidden connection and to prove that my idea that Lovecraft stood behind these modern myths was absolutely and shockingly true. This then is the story of the alternative archaeology movement and the ancient astronaut theory. But it is more than just that, it is also a chronicle of a unique moment in the cultural decline of the West. It is nothing less than an account of how the five-hundred-year advance of science and progress faltered and failed, and with this epic failure came the failure of the Western idea itself. This journey takes us from Lovecraft’s sources in the science fiction and pseudoscience of the late nineteenth century through his own unparalleled fictional work to the various branches of pseudohistory that descended from him down to this very day. Along the way, we’ll see the development of strange theories, ranging from ancient astronauts, to lost civilizations, to UFO cults. Somehow, someway, Lovecraft’s scribbling bequeathed us an eerie legacy of pseudoscience, horror, and the bizarre on the edges of Western culture. And in the end, we’ll understand how Lovecraft’s strange stories have dangerous and unintended consequences for science and for the world today. 1. Rod Serling’s Night Gallery. http://www.nightgallery.net (accessed May 25, 2004). 2. Martin H. Greenberg, Richard Matheson and Charles G. Waugh, eds., The Twilight Zone: The Original Stories (New York: MJF, 1985), p. 1. 3. Alan Landsburg and Sally Landsburg, In Search of Ancient Mysteries (New York: Bantam, 1973), p. viii. 7. Archaeologists use the spelling “Nasca” to refer to the culture that inhabited the Nazca desert. 8. Alan Landsburg and Sally Landsburg, The Outer Space Connection (New York: Bantam, 1975), p. viii. 9. Kenneth L. Feder, “Ten Years After: Surveying Misconceptions About the Human Past,” Cultural Resource Management 18, no. 3 (1995): 11-14. 10. H.P. Lovecraft, The Horror in the Museum and Other Revisions (New York: Carroll and Graf, 1997), cover. 12. Walter E. A. Van Beek, “Dogon Restudied: A Field Evaluation of the Work of Marcel Griaule,” Current Anthropology 32 (1992): p. 157. 13. Robert Bauval and Adrien Gilbert, The Orion Mystery (New York: Three Rivers Press, 1994), p. 7-9. 15. Robert Bauval, message board posting to author via Graham Hancock website, www.grahamhancock.com, April 8, 2001. 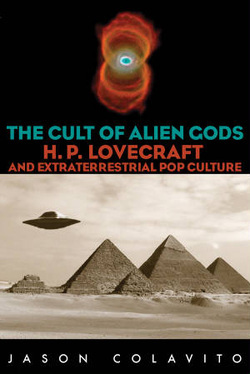 "Prelude" is excerpted from The Cult of Alien Gods: H. P. Lovecraft and Extraterrestrial Pop Culture by Jason Colavito (Prometheus, 2005). This work is copyright © 2005 Jason Colavito. All rights reserved. Reproduction is prohibited without the express written permission of the author and Prometheus Books.